Adding insult to injury, I ruined my MacBook two weeks ago. I poured water on the keyboard and fried the electrical system. My laptop is 6 years old and just barely does what I need it to do, so investing the large sum of money necessary to fix it seems ridiculous. After being computer-free for two weeks and unable to complete loads of important professional and personal communication, I finally broke down and called the Apple people to order a new laptop. Although I am super excited to get a new machine, I am feeling bummed about throwing down the money right now. Truly, through this all, I have felt incredibly grateful. When my friends and family heard of my troubles, many of them offered their couches and spare bedrooms. I ended up spending nearly 2 1/2 weeks at my friends' house, sleeping in their 6-year-old's bunk bed. Now I am staying with my aunt and uncle, who offered to take me in while I look for a new place in the competitive Minneapolis rental market. I feel incredible blessed to be able rest on the kindness and generosity of others during this transitional time; my friends and family gave me a home when my own made me sick. Without this support, I'd be sleeping in my car somewhere (seriously). Now that I am settling into my aunt and uncle's house, it feels good to know I can stay there for a while. I have been craving the ability to settle in a cook a real meal, and on Tuesday night I finally had my chance - I hadn't really cooked in weeks. I was in the mood for the fresh taste of Thai food, and whipped up my own version southeast Asian noodles. I found stability and comfort in the familiar actions of chopping and stirring and seasoning, making a home in muscle memory and instinct. I hope you make yourself at home, where ever you are, and sit down with people you love to enjoy this meal. While pasta is cooking, heat a large sauté pan over medium heat. Add sesame oil. Once hot, add garlic, onion, and chili and saute until onion is soft. Then add turkey and about 2-3 tablespoons of water - the water helps to break up the meat. Break up turkey, and saute until the crumbles are cooked through and most of the liquid has cooked off. Drain and rinse pasta, then add back to pot. 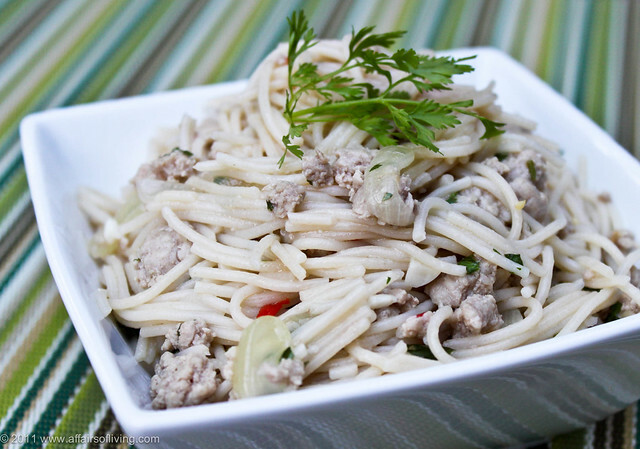 Add turkey mixture to the pasta, along with fish sauce, lime juice, and chopped cilantro. Toss lightly to combine. Serve with additional fish sauce, cilantro, or lime juice, as desired. Leftovers are also good cold or room temperature, served with sliced cucumber.